A miracle is nothing but God building up events and circumstances to talk to you. This is how the events cascaded in the miracle I saw. For quite some time the better half had been obsessed with the Krishna bhajan chhoti chhoti gayyian... Only she kept saying nanhi nanhi gayyian. She was desperate to get the bhajan but we couldn't get it anywhere. Finally she found it in the most unlikely of places - outside the Shiva temple in Billimora. The miracle as it unfolded. On our Delhi to Poona road trip, we had planned for a night halt in Surat, not Navsari. But our friends in Surat had left for Goa that very morning. So we found the hotel Royal Regency at Navasari. It was so good and VFM that we decided to stay for two nights in Navsari. Because of the extra night we decided to drive down the coastal highway between Navsari and Valsad to see the flamingos at Dharasena. Billimora was on the way. We had no plans to visit yet another temple. And that too in Billimora. But the hotel receptionist at Navsari insisted that we see the Shiva temple in Billimora. Yes its the month of Shravan so you must offer your prayers there. Building up... building up... quite like the clouds of the South West monsoon. The circumstances were building up for unleashing a miracle. We parked the car outside the temple. 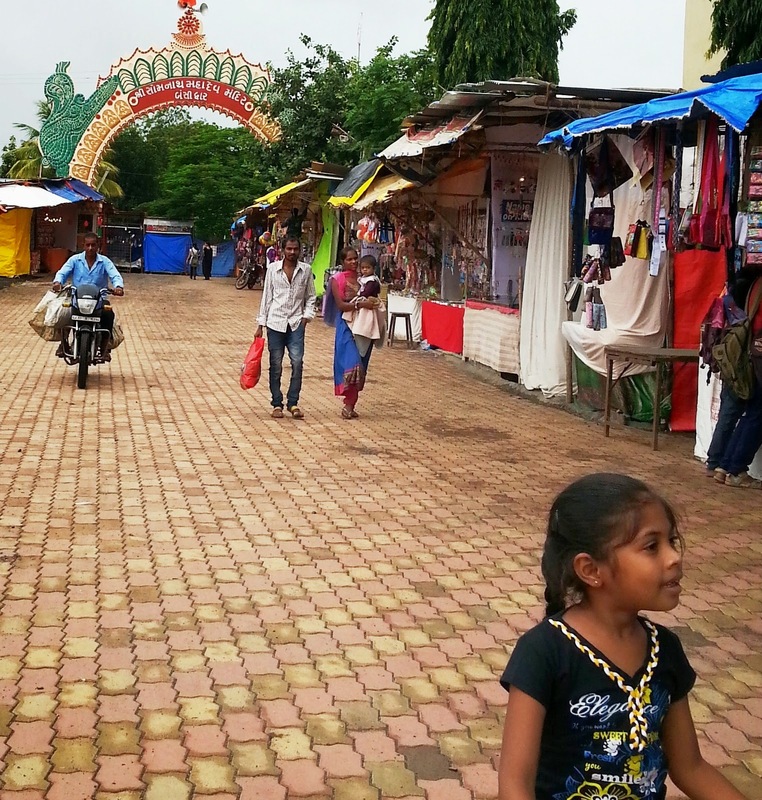 Stalls hawking religious knick knacks, statues, murtis, flowers, the famous ‘American Sweet Corn of Navsari’, religious, foodstuff, iron and wood utensils, coconuts and the like lined the road leading to the temple. As we walked past the stalls to the main temple, the wife suddenly started grinning from ear to ear. 'Hear that? Hear that?' Thrill and wonder and happiness spread like Amul butter on her face. 'What?' I retorted. I wanted to get inside the temple premises – not because of a sudden fervour that I felt for the Gods, but because it was threatening to pour. She ignored me and raced towards a music stall. the owner of the music stall was playing the chhoti chhoti gayyian bhajan at precisely the exact moment when we were near the temple gates! Was this a huge series of coincidences, or God’s answer to a pure heart’s yearning? For me, after this miracle, the temple darshan was simply a formality. God had already shown His hand. PS. We bought the CD. really enjoyed reading it :) The event was God made and Shivji wanted it that very way. Glad you enjoyed this post. A similar thing had happened a day before. You might like to read that post also: Snakes Alive! Or is it a darshan from Shankar Bhagwan? Strange how our prayers get answered in unknown ways at unexpected places! Thanks for your encouraging comments. Yes it is really astonishing how some things turn out to be in life! !